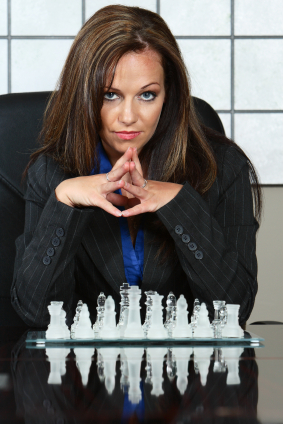 Have you ever wondered what chess and business have in common? Both have a powerful player — the Queen — and both require the ability to read and understand your opponent, the gift of “queens” in business. Playing chess or the business game requires strategy, building relationships, and confidence. The Queen is the sole lady on the chess board, the power piece, with the ability to mount an attack from any direction. She is a true metaphor for women in business, who must understand their opponents, develop rapport, be flexible enough to flow in the direction of the business “game,” and find innovative ways to move past obstacles. As you’ve seen in this blog series on the Alphabet of Entrepreneurs, women are endowed with these strengths, but must know how to leverage them in business to become a formidable force. If you haven’t played, chess is something you should consider trying. The lessons learned on the board directly transfer to the boardroom. It’s not about planning ten moves ahead, it’s about staying just ahead of the curve by strategizing where your next move will take you. Many business owners wait for things to happen to them, rather than driving their business ahead of their competitors. The mindset of “I’ll wait and see what falls into my lap” will keep you behind the crowd. And allowing yourself to get too far ahead in the future will leave you missing the vital details that must be attended to in the present. “Ultimately, what separates a winner from a loser at the grand-master level is the willingness to do the unthinkable. A brilliant strategy is, certainly, a matter of intelligence, but intelligence without audaciousness is not enough. Given the opportunity, I must have the guts to explode the game, to upend my opponent’s thinking and, in so doing, unnerve him. As Garry so eloquently draws the comparison, it’s a balance between the unthinkable and the mundane. To be great you must be ready to innovate, even when all your ducks aren’t in a row. But this type of courage needs to be tempered by mindfulness of the, sometimes dull, day-to-day operations. Success does not come from one without the other. Of “Searching for Bobby Fischer” fame, the real life chess master, Bruce Pandolfini, does not teach his students to be great chess players, he teaches them how to think. Steer clear of the mind game trap – It’s very important to understand your competition, but when it comes to winning in business or chess, you must play the game not the opponent. It’s okay to have incorporate your emotions in business as long as you don’t allow them to rule your decisions. Control your thoughts, direct your behavior. Similar to the game of chess, women often find themselves alone on the “board” in business, but that in no way diminishes the power they can wield when they successfully engage their gifts. The women who are landing on top in business are those who understand the importance of flexibility of vision. Anticipating the moves or reactions of your competition is just as important as planning your next move forward. Never become complacent where you are, for your opponent will be waiting for that chance to take the advantage. This entry was written by Dr. Shannon Reece, posted on November 30, 2010 at 10:20 am, filed under Alphabet of Entrepreneurs, Aspiring Entrepreneurs and tagged businesswoman, chess, entrepreneur, queen, startups, strategies for women. Bookmark the permalink. Follow any comments here with the RSS feed for this post. Post a comment or leave a trackback: Trackback URL.